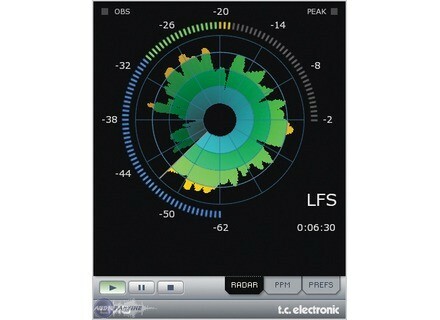 LM5 - Loudness Radar Meter, Tuner from TC Electronic. 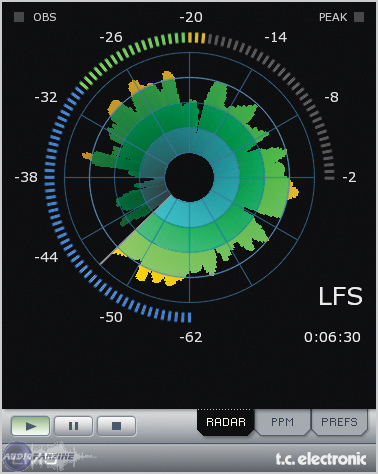 LM5 derives statistical information from the ITU-R BS.1770 standard to visualize instant loudness and loudness history. It helps engineers realize the dynamic range at their disposal during production, and predict the dynamic range restriction needed during distribution to various platforms. In a multi-platform world it is important that delivery criteria can be easily specified and met even by people not primarily concerned with audio. Some of the currently used principles lead to ambiguous level management and consequently, extra time spent on audio production and quality control. LM5 can be used for real-time balancing and specification of any type of audio signal, and covers mono, stereo and 5.1 formats. LM5 is suitable for use in broadcast, post production, film and music alike. An extended version, LM5D Loudness and True-Peak Level Meter with Universal Descriptors, will be available in Spring 2008. Schaack Audio Tech. Transient Shaper Schaack Audio Technologies has announced the release of Transient Shaper v1.0. D16 Group releases Devastor v1.0 D16 has announced the release of Devastor, the first effect plug-in from its new "Silver Collection". IK Multimedia Now Shipping ARC System IK Multimedia has announced that ARC System (Advanced Room Correction System), the first acoustical room correction system in a plug-in for MAC/PC DAW based studios, is now shipping.